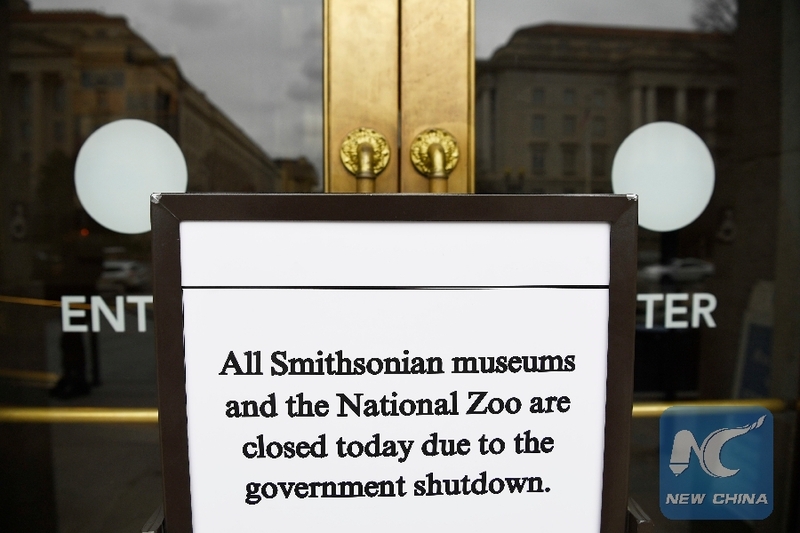 WASHINGTON, Jan. 2 (Xinhua) -- The 19 Smithsonian museums and the National Zoo in Washington D.C. closed their doors on Wednesday as the partial U.S. government shutdown dragged on. "Due to the federal government shutdown, all Smithsonian museums and the National Zoo are closed," the Smithsonian institution said in a statement released on Wednesday. "Museum and National Zoo programming and events are also canceled," said the statement. The National Zoo's live-animal cameras, including the popular panda cam, will not be operating during the shutdown, the statement said. However, the shutdown will not affect the National Zoo's commitment to "the standard of excellence in animal care," the statement added. It is not immediately known when the museums and the zoo will resume operations. The institution said in a Twitter post that it will "update our operating status as soon as the situation is resolved." The government shutdown, which started on Dec. 22, is due in large part to a dispute over how much federal funding should be allocated to President Donald Trump's campaign promise of U.S.-Mexico border wall. The shutdown has affected nine cabinet-level departments and dozens of agencies, forcing about 420,000 federal employees, who are deemed essential, to work without pay, while 380,000 others are expected to take unpaid leave.